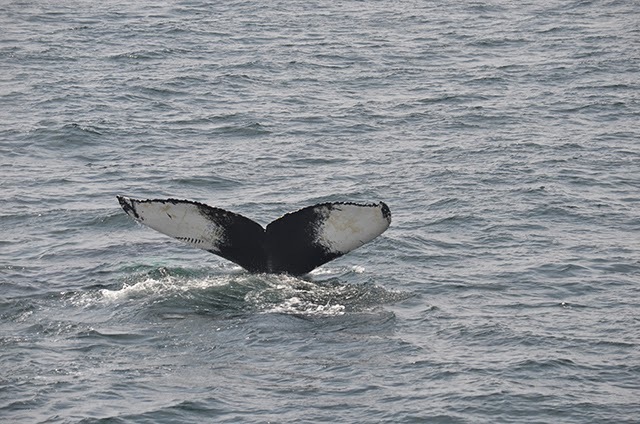 On today’s 10am whale watch aboard the Asteria, we decided to try our luck south as there wasn’t much luck up north. On our way to the SW corner, we first found a traveling fin whale making short quick dives. 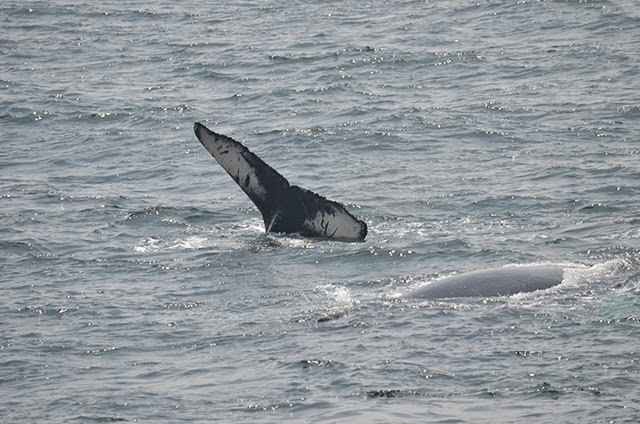 After getting a few looks, we continued SE to find a single humpback traveling through the area, not fluking. 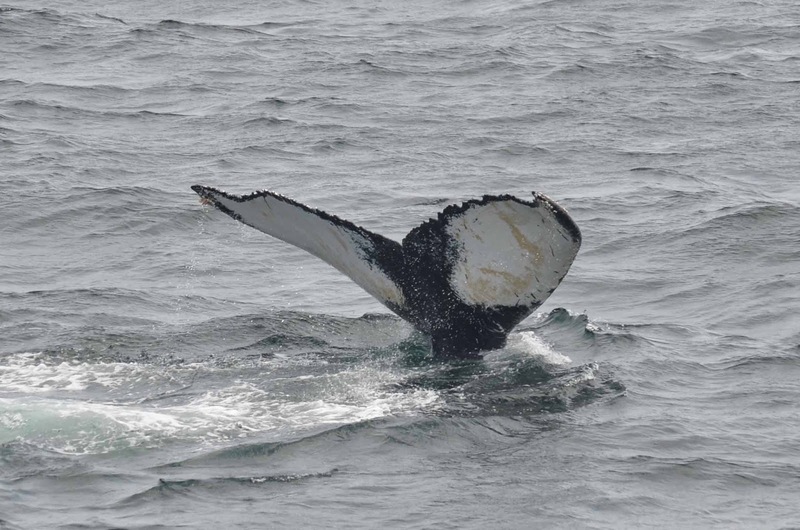 This whale had a floppy dorsal that tilted to the side – if I’m able to ID later I will certainly update this post! We left this whale thinking that it was not going to fluke, but then it surprised us all by fluking on its last look (though not quite enough to ID). 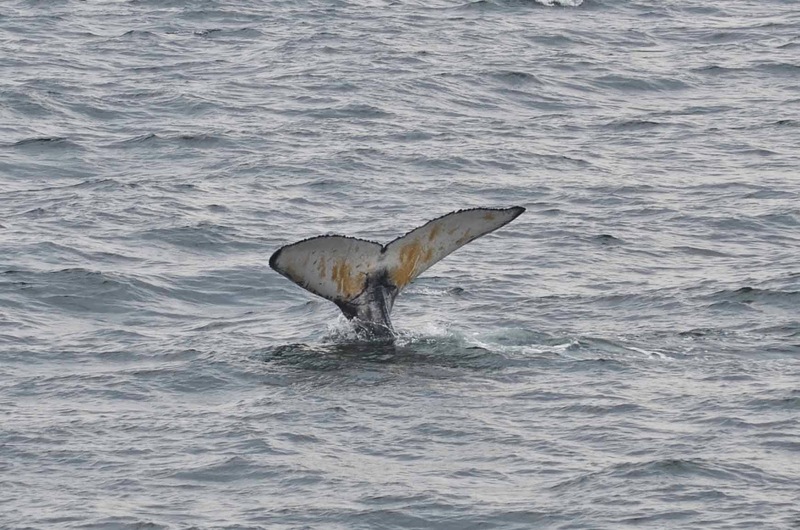 But the enthusiasm of the passengers to see this whale fluke made it quite an enjoyable experience! 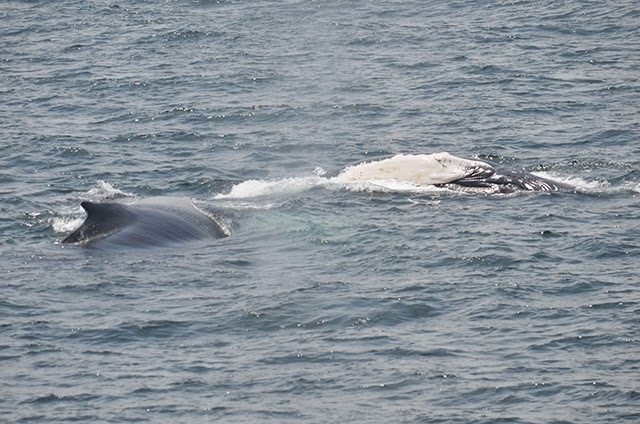 We decided to keep heading east to the SW corner, and were rewarded to find a feeding frenzy of 15-19 humpbacks! As we approached, we watched many joins and splits, including a group of 6 that joined to most likely feed. A breaching calf in the distance caught our attention, so we headed over there to find Echo and calf, and Peninsula. 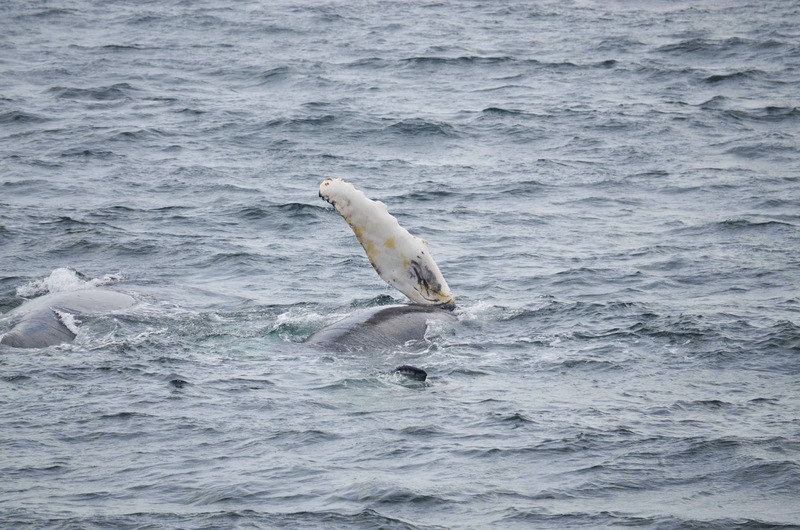 The adults began to log as we got closer, but our calf seemed to be a bit more frisky as it was rolling around, and did one high fluke/head stand. As we left, the calf appeared to be nursing. We also spotted Great and Cory’s shearwaters today. Today we couldn’t have asked for a better whale watch. On our way down south we spotted a couple of spouts in the distance that were clearly fin whales. Since we had reports of whales a little bit further out we decided to keep on going and were well rewarded for that decision! We soon came across a mother and calf pair. The mom fluked within the first few minutes and it turned out to be Salt and Epsom! Salt and her calf were taking plenty of time at the surface with 5 minute dives and the calf was definitely in an active mood. In addition to a few barrel rolls, Epsom was also moving from side to side under Salt and seemed to be nursing. After not fluking for the first few dives, Epsom started to stick its tail far out of the water and wave it around, giving us some great fluke shots. There was a private yacht in the area doing a great job of keeping their distance, turning off their engines, and exemplifying private whale watching! Salt and her calf kept surfacing close to the Aurora as well as the yacht giving everyone incredible views. Epsom absolutely made the trip when he/she breached fully twice and did a head breach once! After that beautiful display mom and calf both took a break but continued to surface at 5 minute intervals. Epsom continued to stick its tail far out of the water and wave it around. 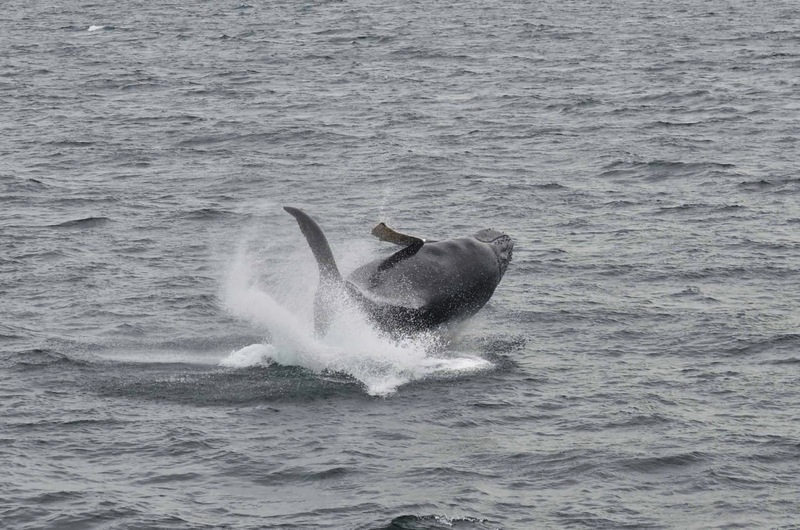 Passengers were extremely excited to learn about Salt, her many calves, and have the unique chance to see one of them breach! It was an absolutely fantastic day!